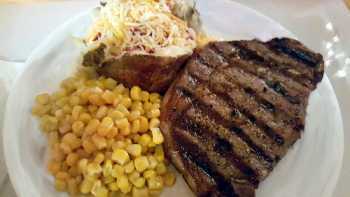 I love a good grilled steak and not just anyone can make it right ;-) I prefer ribeye steak about 3/4" thick. Make sure you have a good grill. 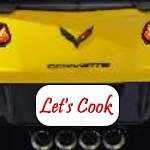 I use a gas grill but you could use briquettes too. A good grill will have even cooking and not have hot spots. If you do have hot spots be sure to place your meat so it cooks evenly. Take your steaks out of your refrigerator about 20 minutes ahead of cooking time, cover and let warm to room temperature. Sprinkle with salt and pepper. Unless you have a poor quality steak, no marinating is necessary. Just some salt and pepper so you don't lose the taste of the steak. While your steak is resting start your grill and bring it up to about 300 degrees. For the perfect medium steak, cook on each side on medium high heat for 6 - 7 minutes per side. I prefer 6 minutes per side with a 3/4" steak. 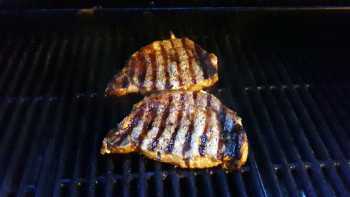 Take your steak off the grill and let site for about 5 minute while you are preparing your side dishes.